A case was laid before the Court of Chancery in 1788 by William Twamley and others, asking the Court to make the Warden and Society of Sutton Coldfield manage their affairs better. The case was not resolved until 1824, and during these thirty-six years some of the income of the Corporation was confiscated by the Court. The sum of money belonging to Sutton held by Master in Chancery in 1824 was £42,036 3s. 1d. The Chancery ruling ordered the Corporation to use this money according to a scheme which called for capital expenditure on schools, almshouses, etcetera, the remainder to be invested so that the interest could be used to defray the running costs. Richard Horton Esquire was Warden (equivalent to Mayor) of Sutton in 1843, and at the end of his term of office in November he had to account for the income and expenditure of the Corporation for the past year. There was the normal revenue, revenue the Warden and Society had controlled all through the Chancery case, mainly rents on Corporation property, amounting to £921, and the dividends received from the £30,554 18s 10d invested capital which came to £890 that year. The account gives income and expenditure in date order through the year, and at the end the main heads of expenditure are assigned either to the old income of £921 or to the £890 dividend money. There was no income from rates, as the poor rate was levied and administered by a different body. Most of the dividend money went on the schools, clothing being provided for all the children as well as running costs for the buildings. Ten teachers received salaries ranging from fifty pounds to twenty-six pounds. The Deputy Steward (i.e. the Town Clerk) was paid £55, £25 from the old income and £30 from the dividends. Apart from park-keepers wages, maintenance of Sutton Park cost the Warden £37.16.s.0d., mainly the cost of planting trees and hedges, but also a large quantity of nails and £4.2s.4d. for John Swift’s game certificate (the Warden could issue this, but had to pay a tax to the Government). Set against this was money paid in by John Swift, amounting to £36.19s.10d., which included £21 5s. 10d. for “ley of cattle” (the fee for putting a cow in the park for a season was 10d. ), “45 score of pruning kids” (i.e. 900 bundles of kindling sticks) for £4.10s.0. and two loads of peat for £1. Entrance fees for non-inhabitants were not introduced until 1863. Harry Smith, landlord of the Three Tuns Inn, provided the customary grand dinner to mark the appointment of a new Warden - “Warduins Chice” - for which he was paid £21 12s; he also provided dinners for the tenants on the two rent days, but this must have been plainer food and drink, only ten pounds worth. Smaller items included 9s. 1d. paid to Mr. Griffiths “for stamping weights and measures” and £1 9s. 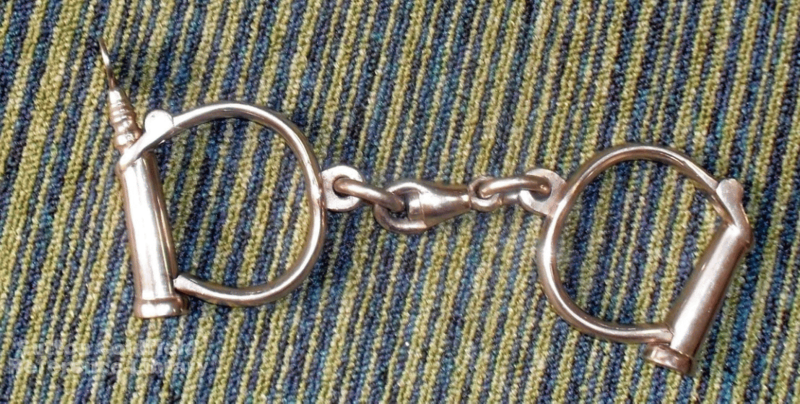 6d to Mr. John Smith for “handcuffs for the police and engraving same”.